Tofu sticks coated with coconut and baked to a crispy perfection. As I browsed around blogland, I found this recipe on Cara's Cravings (featured on Five Friday Finds). I knew I had to make this Crispy Coconut Tofu. Although I sliced my tofu into sticks (for simplicity), You could easily use another shape - maybe cookie cutters for kid appeal? Anyway, back to the crispy coconut tofu - even James, who isn't always fond of tofu, liked it. We served these Crispy Coconut Tofu Sticks with Sweet Chili Sauce, and it brought a tropical feeling to these cold winter months. You can also fry these coconut tofu sticks like the BBQ tofu sticks, but we preferred baking - easier and healthier. 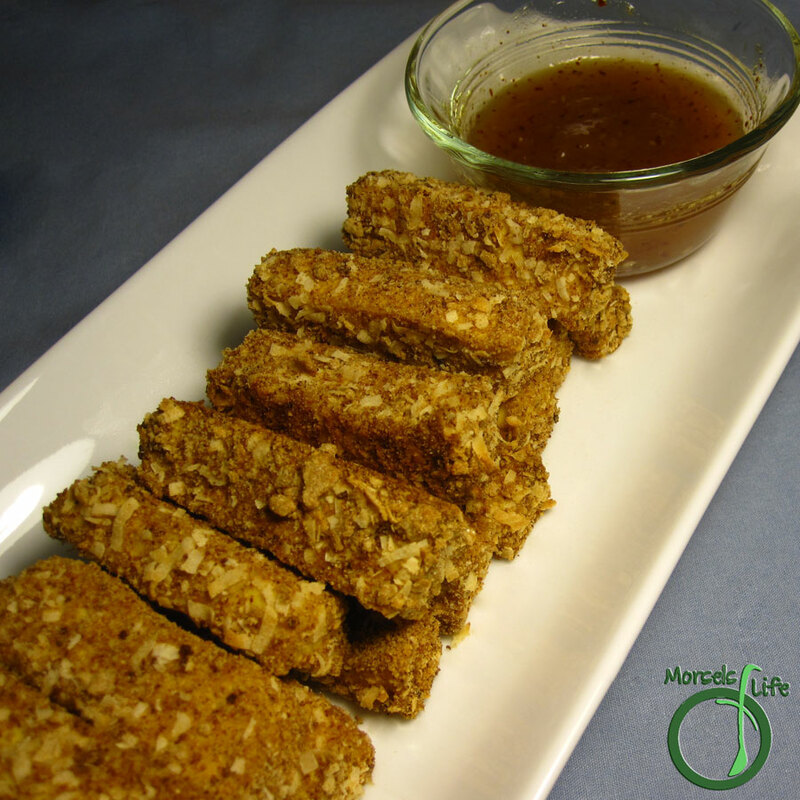 Give these crispy coconut tofu sticks a try and see what you think! What's your favorite way to eat tofu? (optional) Slice each tofu block in half so you have two square pieces, wrap in a towel, and place under a cutting board. Weigh down cutting board with cans, jars, or even a pot. This step will create a firmer and more solid tofu. Cut each block of tofu into 8 sticks. I usually slice in half to form two squares, and then cut each square into 4 sticks. Dip each stick into the egg, followed by coconut/bread crumb mixture. Bake at 375F about 25 minutes, until golden brown and crispy. Perfectly done and looks so yummy!